Family Matters – The Annapolis County Family Resource Centre is a non-profit, community based organization. We began in 1994 as a pilot project through the Community Action Program for Children (CAPC) with Health Canada. The program began out of the coordinator’s basement. We were then offered space in Annapolis Royal. In 1997, the town of Annapolis Royal donated the use of an old house for one dollar per year, and included a grant for cleaning and painting. In 2004, for financial reasons, the centre moved to Bridgetown into the Development Centre. In 2009, we moved to Lawrencetown, which offers a completely accessible space in the Lawrencetown Education Centre. 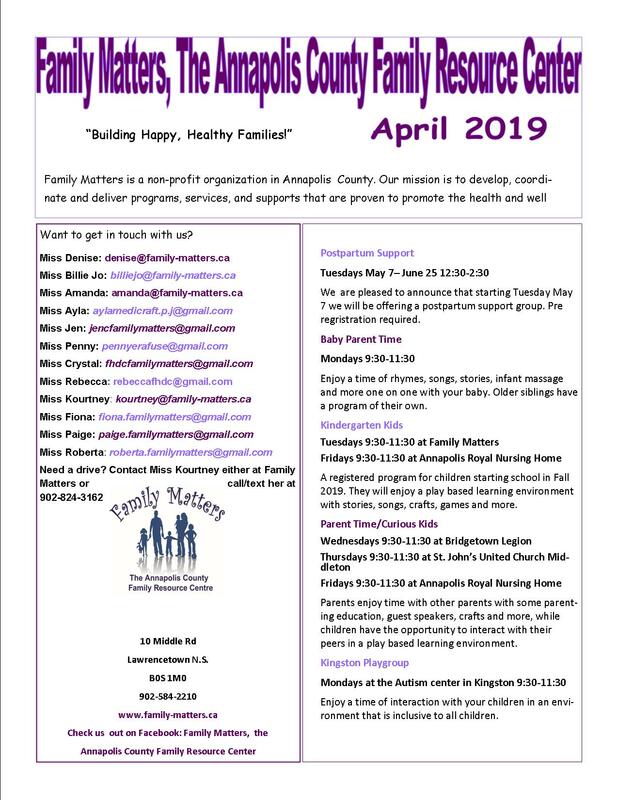 Family Matters provides Annapolis County families with free early learning educational programs that promote early literacy and social development opportunities for pre-school children. We also provide information and support to the children’s parents and caregivers. Although Family Matters primarily focuses on families with pre-school children, new programs are currently being introduced that expand the age group to include families with school aged children. Family Matter’s mission is to develop, coordinate, and deliver programs, services, and support that are proven to promote the health and well-being of children aged 0 to 6 years in Annapolis County. In order to service families of Annapolis County effectively, Family Matters offers programs at our home office in Lawrencetown and also at various satellite locations, including Bridgetown, Middleton, Annapolis Royal, Wilmot and Cornwallis. Family Matters has a non-discrimination policy and welcomes families from all backgrounds and ethnicities.